Ingredients: Enriched Wheat Flour (Niacin, Reduced Iron, Thiamine Mononitrate, Riboflavin, Folic Acid), Modified Wheat Starch, Dextrose, Salt, Whey Solids (from milk), Monosodium Glutamate, Chicken Meat, Chicken Fat*, Onion, Autolyzed Yeast Extract, Chicken Skin, Chicken Broth, Natural Flavoring, Spice, Xanthan Gum, Disodium Inosinate and Disodium Guanylate, Paprika, Yellow 5, Yellow 6. * Adds a dietarily insignificant amount of fat. 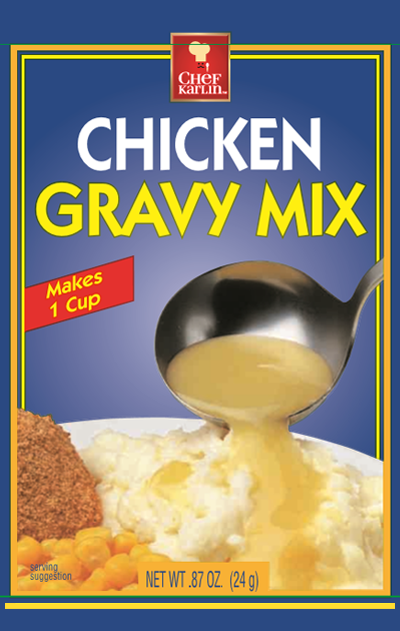 Empty contents of Chicken Gravy Mix into small saucepan. Blend in 1-cup (8-oz) cold water with a whisk. Reduce heat and simmer for 1 minute until smooth and thickened.